Born amidst salt and smoke... Just off the Long Island Expressway... Beneath a bleeding star... 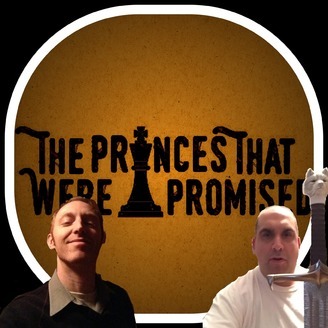 The Princes That Were Promised discuss the History of Westeros and The Known World. Join John and Seannie-Wan as they share their thoughts and observations for beginners and novices to #GRRM's 'A Song of Ice and Fire,' including analysis of the TV adaptation 'Game of Thrones' and all production news for HBO's Earth-shattering series. Any update to the break-neck speed of #GRRM's writing that trickles from the void, or any fantasy/science-fiction property of Royal interest can also be the topic of Royal conversation. Bend the knee and swear fealty to: The Wardens of Long Island, The Watchers on the Couch, The Lords of Chit-Chat-- The Princes That Were Promised. 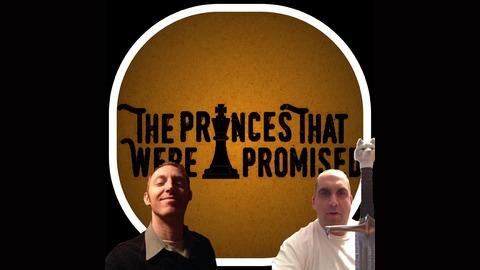 #TPTWP at The Westerosi Companion https://theprincesthatwerepromised.com Call the Banners at Facebook.com/ThePromisedPrinces Send a Raven @PrincesPromised. Jon brings home his new girlfriend to meet the family and things don't go too well! Sansa gets an even higher horse and climbs right up on it. Arya continues her journey to become Batman. Bran seeks out people under emotional strain and stares at them. Ghost spends another day in a kennel too small for him and wonders why his master has forsaken him. John and Seannie-Wan watched Winterfell, not knowing it was called Winterfell, along with 8.4 billion other people. Collectively, The Princes That Were Promised and the other 8.4 billion people forgot about Ghost while watching an episode with every living Stark set at the ancient seat of the Starks. David Benioff and D.B. Weiss finally accomplish their goal of erasing the direwolves from the story without so much as a whimper and celebrate with a high-five marathon.